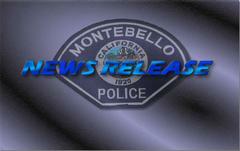 On March 9th, 2019, at approximately 3:00 AM Montebello Police Officers responded to a burglary alarm at JC Penney’s located at the Montebello Town Center. A vehicle was observed crashing into the storefront of the business. The vehicle fled the location and was later located by Montebello officers in the city of Pico Rivera. A vehicle pursuit ensued which led officers into the city of East Los Angeles where the suspect attempted to hit both civilian motorists and police units. As a result, an Officer Involved Shooting occurred in the area of Alma and Whittier Blvd. The suspect was not hit and eventually crashed in the city of Commerce where he was taken into custody with the assistance of the Montebello Police K-9 Unit. The suspect was identified as 37-year-old Tom Rojas. He was later transported and booked for Attempted Murder, Assault with a Deadly Weapon and Felony Evading. Montebello Police Detectives are handling this investigation. All inquiries into this incident should be directed to Detective Lieutenant Larry Jackson at (323) 887-1200, Ext. 293. / LJackson@cityofmontebello.com.